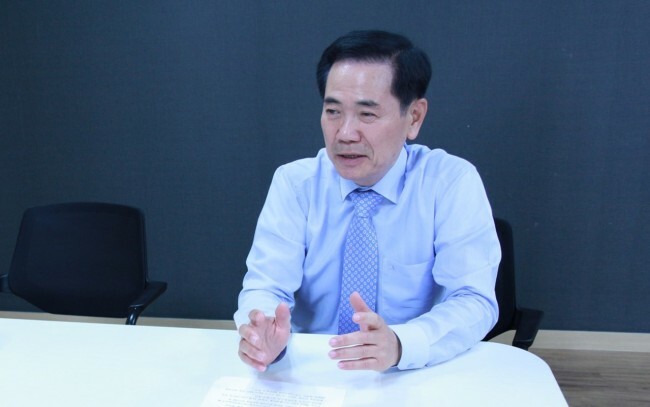 Whoever takes the leadership in organic light-emitting diode inkjet printing may shift the paradigm of the display industry, according to vice chairman of the Korean display association. “If Chinese or Japanese firms are able to take the lead in OLED inkjet printing, things may change in the OLED display market currently dominated by Korean firms,” Seo Kwang-hyun, vice chairman of Korea Display Industry Association, told The Korea Herald in a recent interview. Inkjet printing is a manufacturing method that can produce OLED panels more simply and quickly than current evaporation-based production techniques. It is thought to eliminate waste of raw materials, whereas only 10 to 40 percent of materials end up in final products when using conventional evaporation-based production technology. Viewing Inkjet printing as the next-generation production technology, most display makers -- Korean, Chinese and Japanese firms -- have jumped into research and development of the technologies although mass production is expected to take more than four to five years to bring about due to technological difficulties. “The Korean firms’ inkjet printing technology is currently more advanced than other nations, but they can’t be complacent about the future due to Chinese and Japanese firms aggressively investing on the back of government support,” Seo said. Last month, Chinese display giant BOE surprised attendees by unveiling a prototype inkjet printing-based QLED at the Society for Information Display’s symposium Display Week in Los Angeles. In April, Japanese display maker JOLED also produced inkjet printing-based OLED for the first time in the world. Korean firms Samsung Display and LG Display have not yet unveiled any prototype based on inkjet printing although they are also developing the technology. Apart from inkjet printing technologies, new display technologies, including Micro LED, can also become a risk factor for Korean companies, Seo said. Micro LED, which is primarily aimed at small devices such as smartwatches and smartphones, is emerging as the next-generation display technology with higher resolution than OLED. It is also suitable for new technologies, such as augmented reality and virtual reality, which require higher resolution images. Apple has started devoting more R&D resources toward Micro LED in recent years, by acquiring the US Micro LED startup LuxVue Technology in 2014 and secretly running a lab on next-generation displays in Taiwan. The US tech giant has secured a significant level of Micro LED technology and might begin its trial production this year, according to latest news reports. Experts said Apple may try to make more efforts to reduce its reliance on one or two Korean display firms due to a supply issue. Samsung Display, which currently has more than 95 percent market share in the global OLED market, is to solely supply OLED panels to Apple’s new iPhone 8. However, the launch date of Apple’s new device is reportedly to be delayed due to the lack of supply from Samsung. The global Micro LED market, including smartwatch, smartphone, laptop and lighting, would grow to $19.9 billion by 2025 from $254 million in 2017, according to the research firm Markets and Markets.